Once upon a time, link building became one of the best methods to boost a page’s ranking on Google searches. It became an SEO necessity that everyone’s willing to take advantage of. Everyone had their eyes on their PageRank scores to keep tabs. Nowadays, the Google Toolbar PageRank data is unavailable. And then, some claim that link building is still important while others say it’s at the bottom of their list. So, what happened in between? Link building became a competition and buying links turned out to be easy. Manipulating links wasn’t even a break-a-sweat type of method. It was like an insult to its developers Larry Page and Sergey Brin. Fortunately, Google does not want to stop there. As they strive to become the most reliable search engine, they developed updates and algorithm changes to combat unwanted Search Engine Optimization strategies. So, in 2018, is it still a method that site owners should use? Yes. Here’s why. · The sites are using the same design, IP address, and hosting. · The sites are publishing duplicated blogs, videos, or photos. · Each of the sites’ backlink profiles are showing too much interlinking or similarity. · The sites have hidden ownership. · The sites are showing a pattern in linking to the same pages irrelevantly. Note that doing the following research will need tools from trusted sites. Use your better judgement or ask an SEO specialist for assistance. Link profile quality will soon be the basis for link building. By now, we should have already noticed how Google marches forward, saying that quality is a site owner’s powerful tool. The same goes with our link profiles. It’s not even difficult to have one. If you focus on using links that relate to your site, earn valuable links in return, use meaningful anchor texts, without connecting it to any conniving techniques, then Google will eventually count that as a reason for your page to move upward. Your site’s influence on others will eventually be the foundation of your brand. As you continue building relationships with site owners and other people on the web, you are making it easy to collaborate with them in the future. One method I’ve noticed is that, two site owners earn from the same content by merging their information. Another is when a social media influencer provides exposure to a site that captivated his/her interests and shares it with the followers. There’s also a reason why many claim that link building isn’t what makes SEO. This is because plenty of optimizers are still obsessing on link building, hoping that it is the only answer, just like the good old days. We can’t blame them, but it isn’t that easy anymore. In fact, link building should only be considered as one of the effective methods (if done right) and not the ONLY method. Providing unparalleled user-experience must be the priority for Search Engine Optimization. Now let’s talk about why link building became a star back in the days. It’s thanks to these guys: Larry Page, Sergey Brin and the result of their intellect, PageRank. Page and Brin developed a mathematical formula that assesses the characteristics and amount of links earned by a certain page. It’s like a popularity vote and when a page’s score looked great, they’d likely earn the top spot of a Search Engine Results Page (SERP). It was easy to keep track of a webpage’s score before because of the Google toolbar that was born in 2000. After 16 years, the information ceased its availability due to the negative aspects it unleashed. For now, PageRank works internally and is still one of the reasons why earning links continue to be fruitful in SEO. To optimize PageRank, one must master the rules of quality, not quantity. You can also take advantage of tools that serves as a page rank calculator. If you’re working with an SEO team, it is possible that they are already using one to ensure that they deliver the best results to their clients. If you have an in-house SEO group, feel free to browse the web for the best rank calculators, only if you find it necessary to have one. · Keyword Research: What we know now might not be enough to what search engine users are often using. · Page Speed: It’s unfortunate that some still need to be reminded about this. But really, how can we expect people to stay or share our pages if it takes 2 minutes to load? Alright, it’s an exaggeration, but you get the point. · Enhanced Content: Well, aside from it being authoritative and unique, it should also spark the interest of the clients you want to appeal to. Using schema markup and rich snippets can also enhance content. 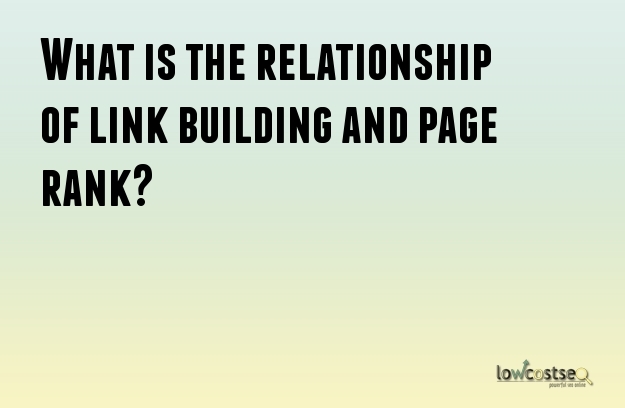 Link building and understanding how PageRank works will be beneficial for many of us. But with technology evolving every year, staying ancient isn’t the best approach. Combining the new with the old can be a good basis in developing a strategy.